I kept hold of my empties in February as I didn't have very many... although when combined with March's, there are quite a few! 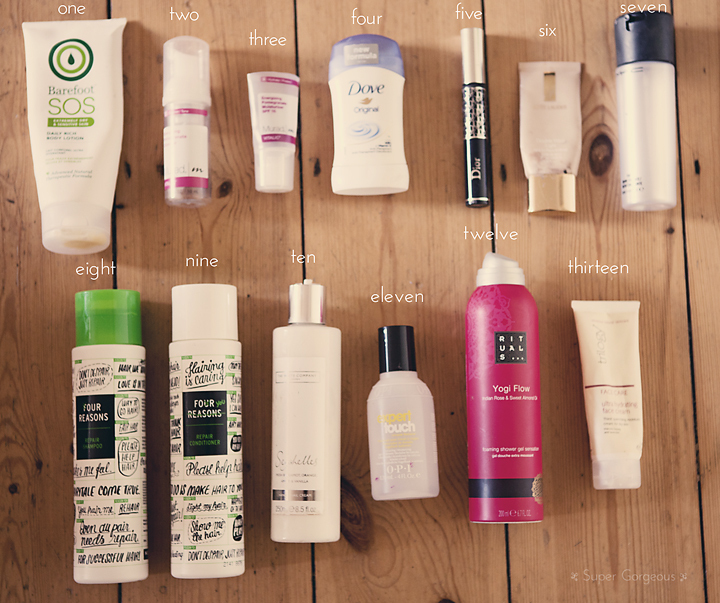 I have uploaded a video, showing which products I've used up over the past two months. If you're more of a reader, than a watcher - this bit's for you! one - Barefoot SOS Daily Rich Body Lotion (£21.95 for 200mls available here) - this is a gorgeous body moisutriser that has converted me to daily body moisturising! It is rich, sinks in well, and the smell reminds me of Neunco (the Spanish baby bath!). My skin is left gorgeously smooth when using this. two & three - Murad Cleanser & Moistusriser from the Embrace Balance Kit (full kit £37 available here) - these are great little products, the perfect size for travelling with, and totally do their job. The cleanser is dispensed as a foam and leaves my skin feeling clean and fresh with no tightness. The moisturiser is oil free and gives just the right amount of moisture to my skin without leaving it greasy or shiny (full blog post here). four - Dove Original Deodorant Cream Bar (£2.49 for 40mls here) - I know it's a bit of a weird one to add, but I've used this for eternity and just love it. It keeps me protected, has that classic Dove smell, and doesn't give me crusty pits! five - Dior Diorshow mascara (£23 available here) - This is now my favourite mascara. It's fat, bristly brush delivers fab fat lashes - you can build it up to the max and it still looks great. I now want to check out some more of the Dior mascara range. Totally sold! six - Estee Lauder Double Wear Light Foundation (£26.50 available here) - I know this has featured in every single empties post I've done, but that's because it's the one I love! It's not perfect, but it's the best I've tried, and believe me, I've tried a lottttttt of foundations. It's full coverage without being cakey, and longwearing. seven - MAC Fix+ (£7 for £30mls available here) - Fix+ is such a versatile product, I love it! You can use it to prep your skin for a bit of moisture without greasiness, as a mixing medium (although I think this is very expensive to use in this way if you have water available), or to refresh your skin after you've put on your make up. This is my favourite way of using it. When you look too powdery or matt, give yourself a spritz of this and you will be restored to looking like a human, without runing any of your make up. eight & nine - Four Reasons Repair Shampoo & Conditioner (£8.95 each available here) - I think the design of these products is great - they would totally make me stop and look among the shelves in the shops. They smell of gorgeous green apple, and seemed to lessen the amount of split ends I had (full blog post here). ten - The White Company Seychelles Hand & Nail Cream (£12 for 250mls available here) - this technically isn't an empty - the pump broke so I'll have to decant it into something else and chuck the bottle, thought I may as well include it. I adore the Seychelles range from The White Company - I have the candles, room diffusers and room spray... wishing that my house would smell like that constantly. I just l.o.v.e - love it! I'd group the smell in the same family as MAC Turquatic Hue (incidentally, my fave perfume!) and the smell of Hollister, but a bit more 'grown up'. Smell it! eleven - OPI Expert Touch Lacquer Remover (£7.60 for 120mls available here) - I normally tend to use any old nail polish remover, but this happened to come as part of a free gift with a subscription to Grazia magazine. I really liked that the main smell of it was citrusey, rather than the usual stench you get with high street removers. twelve - Rituals Yogi Flow Shower Foam (£6.50 for 200mls available here) - this is probably one of the first items from a beauty box I have actually used up! It comes out as a gel but turns into a densely packed lather, and smells gorgeous too. thirteen - Trilogy Ultra Hydrating Face Cream (£24.50 for 75mls available here) - Wonderful moistusier which soothed my dry winter skin back to normality. Calming, comforting - it sorted my dry patches out without making my oily bits oily - I'll definitely re-buy next winter (full blog post here).